Preheat oven to 425°F. 2. Toss artichoke bottoms with 2 teaspoons oil and 2 teaspoons oregano. Place them top-side down on half of a large baking sheet. Spread the turkey bacon in an even layer on the other half. Roast until the artichokes are just beginning to brown and the turkey bacon is crispy, 12 to 14 minutes. Heat the remaining 2 teaspoons oil in a large nonstick skillet over medium-high heat. Add the eggs and cook, folding and stirring frequently with a heat proof rubber spatula until almost set, about 2 minutes. Remove from the heat and fold in cream cheese, the remaining 1 teaspoon oregano and salt. To serve, divide the artichoke bottoms among 4 plates. 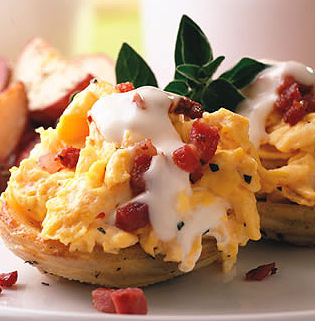 Top each artichoke with equal portions scrambled egg, crispy turkey bacon and creamy lemon sauce. Garnish with oregano sprigs, if desired. This entry was posted in Entrees, Holiday, Modified Profast (Fast and Flexible) Recipes and tagged artichokes, easter, eggs, Metabolic Medical Center Recipes, metabolic recipes by foodies4mmc. Bookmark the permalink.